Dorie Greenspan changed the way we view French cooking with her bestselling book Around My French Table. Now she's back with even more insight into that world with Baking chez moi, full of delicious confections you can make at home. One example from this beautifully photographed book is the surprisingly easy chocolate loaf cake speckled with cubes of dark chocolate that have been melted, salted, and frozen, which she adapted from a French chef's recipe. Whether it's classic lemon-glazed madeleines or “Les Whoopie Pies,” Dorie puts her own creative spin on each dish, guiding us with the friendly, reassuring directions that have won her legions of fans. Dorie Greenspan promotes Around My French Table: More Than 300 Recipes from My Home to Yours. Dorie Greenspan is currently considered a "single author." If one or more works are by a distinct, homonymous authors, go ahead and split the author. 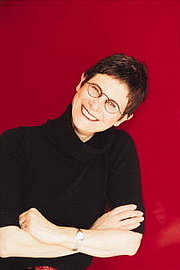 Dorie Greenspan is composed of 1 name.